Every vise has a little play/slop in the screw. This is normal. If there was none then the screw would bind. 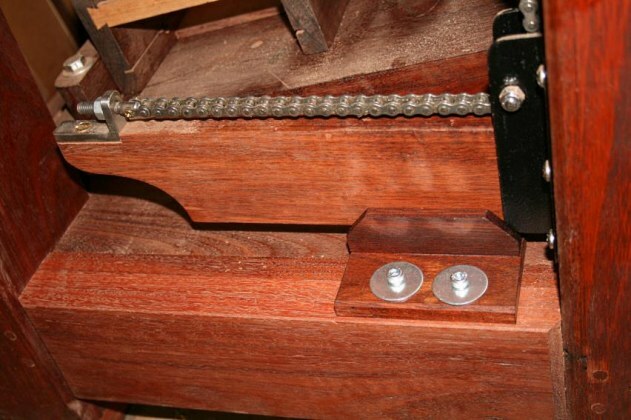 Play is a double-edged sword – play in a leg vise is desirable when clamping out-of-square pieces. 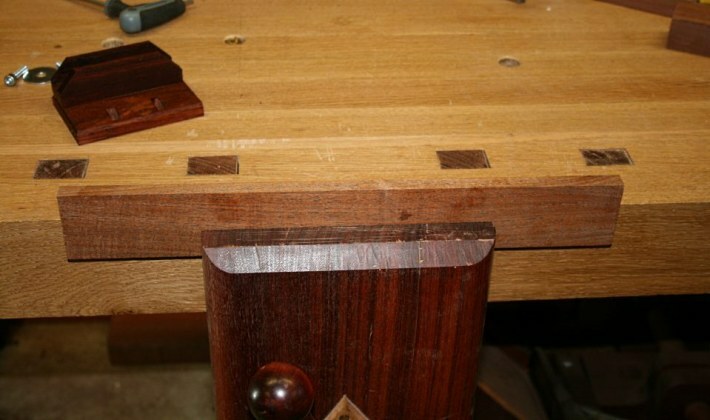 However, play also then favours one side of the chop over the other, and greater cranking force is required to keep the piece from tipping when planing squared boards. 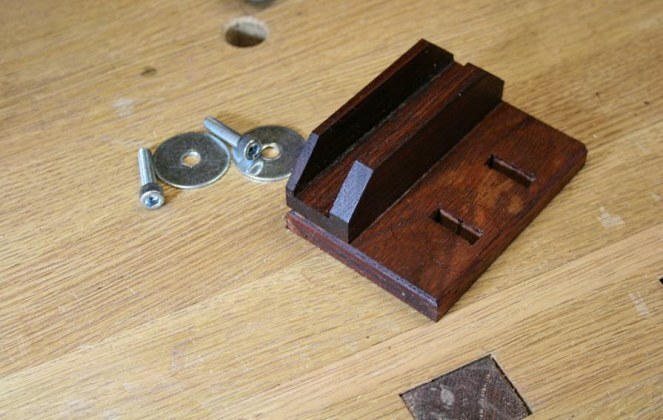 My leg vise uses a wooden screw and has a little play. How much is acceptable? I was very careful when building the leg vise. Indeed, for those who followed my bench build, they have seen pictures of the installation (twice – the second when I added the AYS chain adjuster). Everything was square, square, square … and solid. When it was new the chop would clamp down squarely and hold with just a little force. As it wore in, the play seemed to increase a little, and then the chop began to reveal more clamping strength on one side. 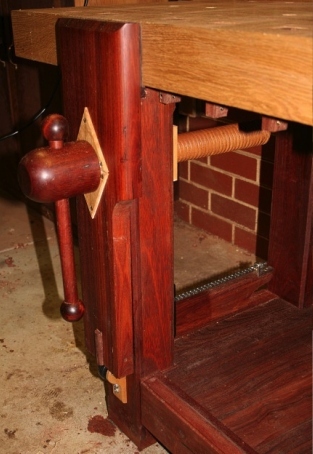 In my case there seemed to be less holding power on the “outfeed” side of the vise (the left of the vise in the picture below), which may have occurred as a result of planing edges (i.e. that is where the plane ends and greater downforce is created). There is nothing worse than the board twisting and dropping down as you plane. Damaging to yourself and the edge being planed. I imagine that the play in a high quality ACME metal screw, such as from LN or BenchCrafted, would have the least play. A wooden screw is less precise. I imagine that others experience the same as I do. I’d like to hear if this affects you to. If you are unhappy with this issue, then there is a simple fix. The problem is not simply the screw, but also the parallel guide. They work together. The parallel guide must also have a tad leeway to avoid it binding in the leg mortice. Even 1mm of leeway will translate into 1mm of play in the screw, and from there to the chop. The aim is to get – and hold – everything perfectly square, in such a way that the pressure across the chop is equal, and stays that way. The fix is at the parallel guide. The parallel guide requires a guide to keep it tracking squarely. My solution was to groove a section of hardwood that the guide could run through, and add in adjustability so that the exact support could be dialled in. (Edit: It is possible that one could simply make a single point contact for each side. My head says this should work, however I have not tested out the idea). Your set up would look like this in principle, but may vary according to the way your leg vise and parallel guide are designed. (Note that the groove/mortice in mine is not centred – not to worry. In my case this does not matter. I was testing out the idea, but it worked so well that I have left it as is). Simply slide under (as in my case) the parallel guide. If you cannot do this, just consider make a fence that bolts from both sides. Adjust for squareness, and you will find that the amount of force to clamp work decreases significantly. I am once again back to a ¼ turn for very secure clamping. If you wish to return the vise to original (racking) state, simply disengage the Guide Guide (loosen the bolts and allow the parallel guide to move freely). There are, however, much better ways of achieving the goal to clamp tapered pieces. William Duffield has come up with a fabulous idea.